The scaffolding is coming down! 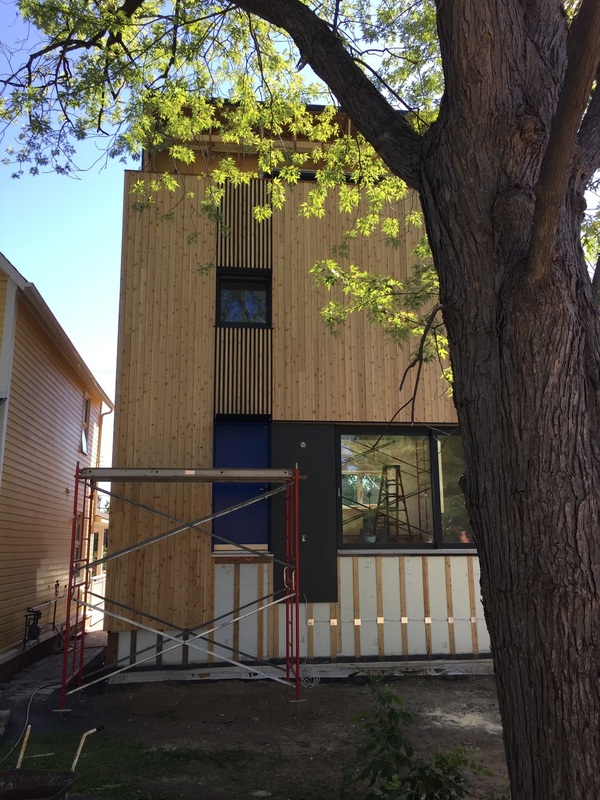 The Hardie panel on the front, and along the south side still needs finishing, but otherwise – the siding will be finished this week. Major excitement. The drywall will also be finished this week, including the first layer of primer. Over the weekend, Mark and I worked away on the house. My mom was in town to facilitate this, helping to watch our girls. It’s extremely satisfying to get out and swing a hammer, so to speak. We made great progress as well. We did a massive cleanup of the job site. We’ll be returning unused lumber and selling or giving away the rest on Kijiji. It’s starting to look less like a job site with all the construction material cleaned up and scaffolding mostly down. We filled another waste bin to the max. The amount of waste our build has generated is something I’m struggling with. Even though most of the materials came from the earth (wood and gypsum), it doesn’t feel good throwing them back in a landfill. There’s a lot of embodied energy in our dumpster. Our friend Gary told me that according to CMHC, the average waste produced by a new home is 2.5 tonnes. That’s about one and a half dumpsters the size we’ve been using. We’ve already filled two and have ordered another one… Our house is no average house, on the other hand. There's a lot more material inside our walls. Considering our walls are two feet thick, and a standard house maybe 8". This is a case for building for the long term. That helps to put me at ease. Over the weekend we also started laying the subfloor for our tile guy, who will be starting later this week. We also started on our wood ceiling. Wood ceiling you say? Why yes. We’ve decided to build a slatted wood ceiling. This will add to the sense of discovery we’re hoping to create throughout the house. And will enable us to get clever with our lighting solutions, and hide the mounting tracks. Tons of coordination efforts this week. Things are shaping up. House adornments -- pigeon scaring tactics seen to be working! The final façade well underway. Graham’s crew has been working OT on the siding. Making up for some major squaring issues we discovered with the shell. We’re on the final facade – the front. They’ve finished the cedar and now just have the ‘eyebrow’ detail, as we’re calling it, over the doorway and canopy to finish up next week. They also need to add the hardie to our rooftop, and the west and south sides of the house. Hopefully the siding will be finished up next week. We can take the scaffolding down. Clean up the yard and start to have a finished-looking house in the works. Cannot begin to tell you how excited I am for this. With the delay in starting, Mark’s bro Brian, who flew in to help with the drywall, couldn’t finish the job. But he left us in good shape to have a new crew take over. He also encountered the slow downs of having to remedy unsquare walls, but did a bang up job hanging drywall throughout the house in spite of this setback. He also managed to tape and mud all the rooms on the second floor. This upcoming week we have the new crew starting. We hope it goes quickly and will be finished up next week as well. They have to do the taping, mudding and corner beads for the remainder of the house. Minus the basement suite. Mark and I will finish that on our own time and our own dime after we’ve settled in. We’re ordering all our tile from Ceragres. In the bathroom, we’re doing big white ones on the walls and small black ones on the floor. On the main floor and entries, a 24” x 24” and 12” x 24” jumbo porcelain tile combo in a darker ‘licorice’ colour. We’re decided on an installer as well. Mark was contemplating DIY’ing the tile with the help of Gary, but since he already has a million odd jobs to tackle, this was one we decided to leave to the pros. We’re getting wood for the rest of the floors from the Wood Source. White ash in 5” boards that will be site-finished by Graham and his Vessel wood crew. We haven’t decided on a finish for them yet. Stain or oil. No idea. Going with Caesarstone for the island counter top. Not sure if we’re going light or dark yet, however. For the window sill come countertop in the kitchen, we’re going with a maple butcher block. Really looking forward to chopping things in that lovely window. I’ve got some paint samples I’ve been playing with on the walls. Looking to find the perfect white for our house. Mark’s business partner Rebecca swears by an untinted, straight from the can, titanium/gesso white. I’m not sure if I want the house to have gallery walls or if I want a slight bit of warmth or grey to them. All signs point to titanium. At this stage, our MVP is aimed at occupancy permit. That’s what our focus is — the minimum required for move-in. Things like the basement, doors and trim, we will finish up on our own. Once the drywall is complete, with the first coat of primer – a Benjamin Moore vapour retardant primer – we’ll get a painter in (might go by the name of Meghan or Mark), and get the floors started. The big deadline pushing things forward at the moment is our kitchen install, which is scheduled for July 10th.. We still enjoy telling people we’ll move in at the end of July. But I’m definitely not holding my breath on this one.